Want to know what life is like in prehistoric times? Play dinosaur games now on Games.lol. Control angry cavemen, hunt dinosaurs down and survive an archaic setting. Become a legendary dinosaur hunter! Dinosaurs are indeed some of the most legendary creatures in history. They are even the most feared ones to have ever walked the earth! These ancient and immense creatures were once kings. Now, you can learn more about them and experience their presence (albeit virtual) through dinosaur games. Enjoy a make-believe world through dinosaur shooting games. Dinosaur hunter games enable you to take control of some of these mighty creatures and, at the same time, recreate some of their epic actions. Survival dinosaur games are very exciting as well as robot dinosaur games! Dino Hunter: Deadly Shores give you the chance to encounter lifelike dinosaurs face-to-face in the game’s 3D virtual setting. Other games like T-rex games give you the adrenaline rush of hunting – and sometimes being hunted by – these colossal creatures. Of course, our collection of dinosaur games also includes a fun and feel-good experience. Other dinosaur games are about solving puzzles and solving problems. Why not try out one of these fantastic dinosaur-themed games today and turn the clock back to the prehistoric era! Treat yourself to a plethora of dinosaur games that are all waiting for you to download and play. What is more, you will not be spending a single cent – these games are free! Dino Hunter: Deadly Shores sets the bar high for any dinosaur games with its stunning graphics, fantastic controls, and remarkable gameplay. This dinosaur hunting delight allows you to hunt the ferocious beasts that come in all shapes and sizes. Rendered using one of the most sophisticated game engines in the world, you can expect a visual treat from the detailed graphics of the weapons, rich jungles and towering dinosaurs in Dino Hunter. Get a close-up view of the most vicious dinosaurs including the Velociraptors, Triceratops, Spinosaurus, Allosaurus, Stegosaurus, and of course, the king of the dinosaurs – The Tyrannosaurus Rex. Dino Hunter: Deadly Shores offers intense gameplay due to the action and realistic environment. Equipped with high-caliber weapons, you can explore the Jurassic world and experience living in an environment where mighty reptiles and fearsome creatures roam freely. Collect weapons such as crossbows, rocket launchers, grenade launchers, rifles, pistols, and shotguns to upgrade them and take down bigger dinosaurs, getting higher bounties and rewards! Dinosaur hunting games are purely fantastic. Kids and parents can play these free dinosaur games with much enjoyment. Dinosaur games for kids such as the Lego dinosaur games can be accessed for free. Where else can you find dinosaur games online and for free? Stay tuned for more cool and amazing dinosaur games! 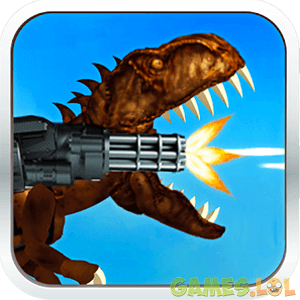 Fans of dinosaur hunter games will absolutely rejoice in this fast-paced, thrilling, and awesome dinosaur shooting game. Travel back in time and meet these majestic creatures with top Dinosaur Games on Games.lol!